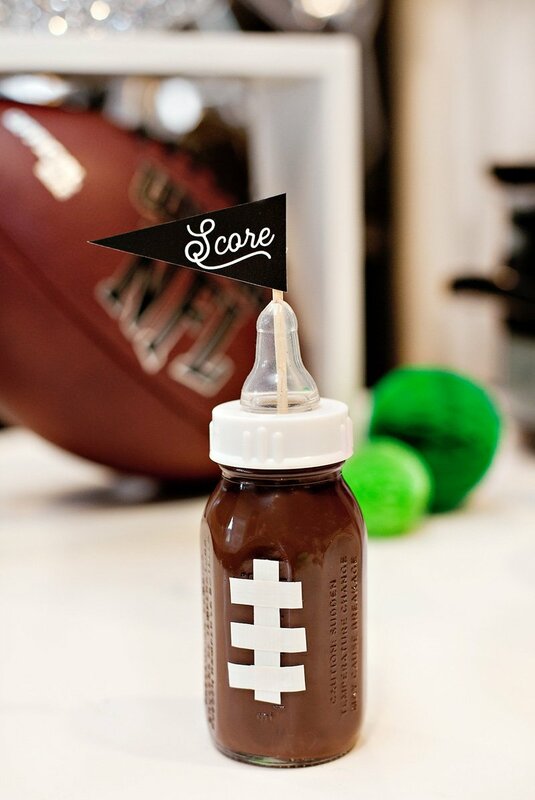 This football themed Sip and See might be my favorite idea for a new baby celebration to date! 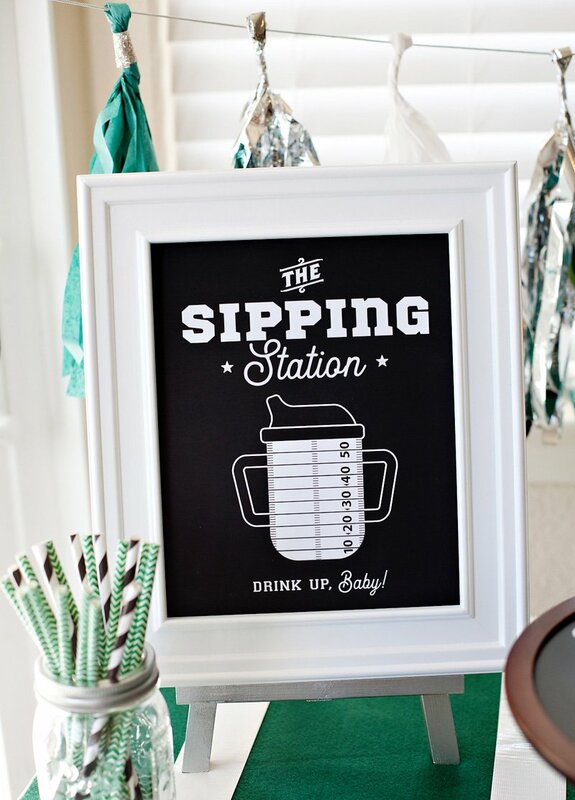 In case you’re not familiar with the term, a “Sip and See” is an open-house style gathering where several people come over to meet a new baby within a specified window of time. They can stay for a while or just pop in for a few minutes. 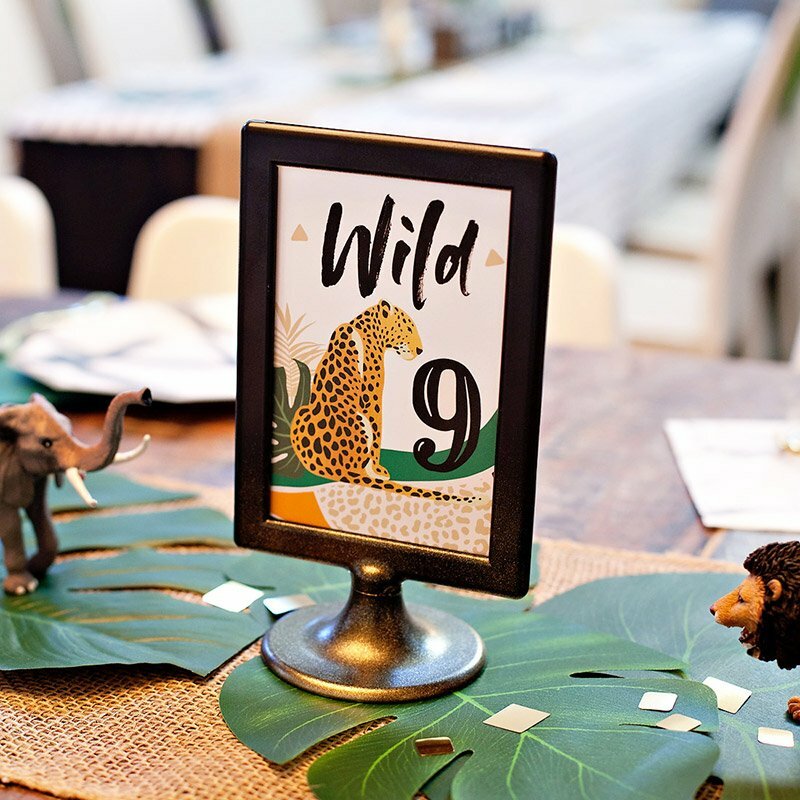 It’s a fun excuse to get together, AND it saves new parents from having to accommodate the various schedules of a zillion different people that are all anxious to meet their little one. One big thing to consider though: not everyone can hold the baby at once, which means it’s a good idea to have something else to keep your guests entertained too. So… HELLO, WORLD + HELLO, FOOTBALL! Timing a Sip and See to align with an NFL game provides the perfect extra entertainment for your guests: it’s fun, it’s social, and, most importantly, it’s low-maintenance. They’ve got something to focus on while you’re busy chatting with others, and you’ve got a great theme to work with… your favorite NFL team! Or the favorite team of the guests of honor, if you’re hosting this party for a friend. So with this in mind, I’m excited to team up with NFL Homegating to bring you some inspiration for hosting your own NFL Inspired Sip and See! 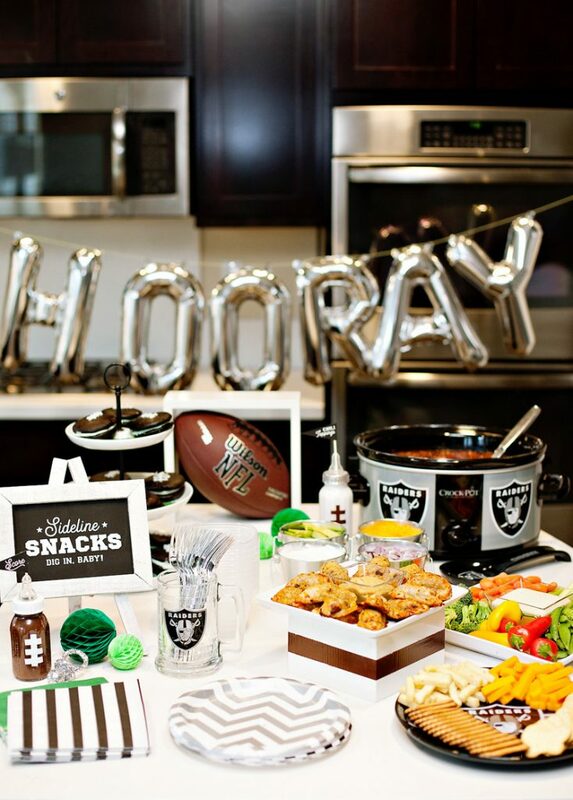 NFL Homegating is all about celebrating your team at home. I stuck with my own favorite team here (of course! 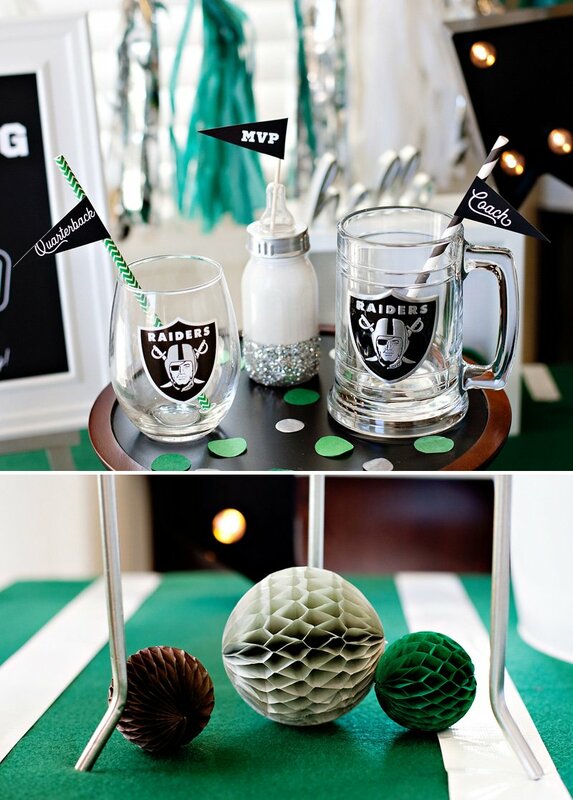 ), but you can easily swap out the Raiders glasses and serveware with versions that feature your own favorite team. P.S. 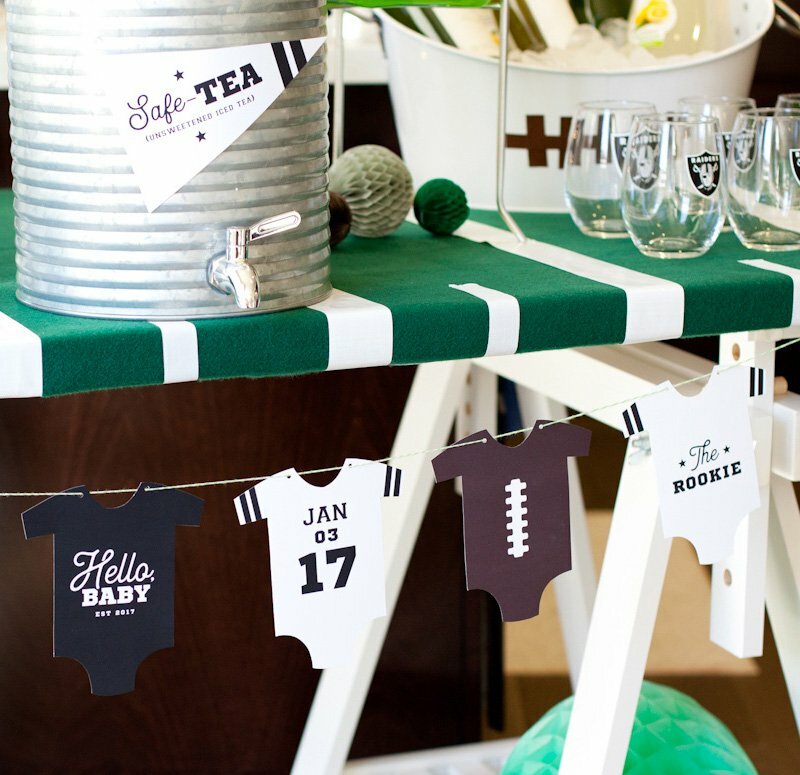 Even though this NFL season is coming to an end soon, all of these ideas would work great at a regular football-inspired baby shower too, which can happen year-round. Plus, the next NFL season will be here before we know it! Since this is a SIP and See, drinks are key of course! Set up a station that makes it easy for guests to help themselves. Make sure to have a variety of options available for people of different ages and tastes. I always like to offer one party punch with a fun name that matches the theme + the standard basics (water, iced tea, wine, beer, soda). 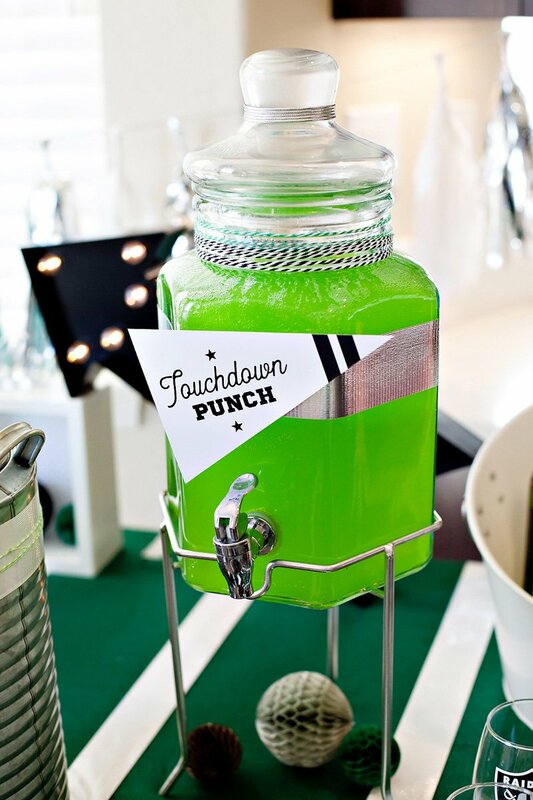 This “Touchdown” Punch is simple yet tasty. It’s just store-bought green fruit punch (kiwi strawberry flavor) + lemon-lime soda. For an extra point though, throw in some lime sherbet and/or champagne! Speaking of fun names, I couldn’t resist calling the iced tea “Safe-TEA” as a play on the football position/play. First up is this decorative drinkware display, which is a nod to both parts of the theme (sipping and NFL), as well as to the family that’s being celebrated. 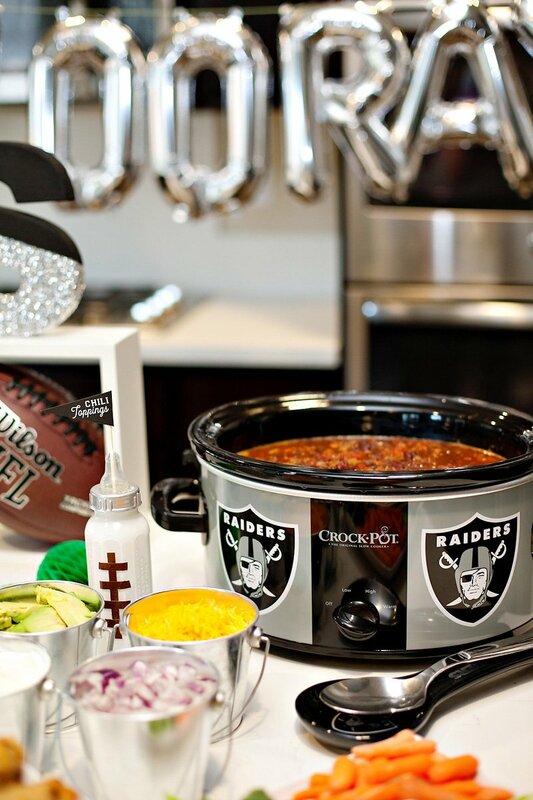 There’s a wine glass for mom, a beer mug for dad – (both from NFL Homegating) – and a DIY painted bottle for baby (a.k.a. the MVP!). If you’re hosting for someone else, the glassware can also double as a thoughtful gift for mom and dad after the party. The mini Quarterback, MVP, and Coach flags can be downloaded below. Since there’s not a whole lot of obviously “baby” stuff happening on top of the table, I thought a onesie banner was in order to help highlight the occasion more obviously. ;) These are available to download below as well. 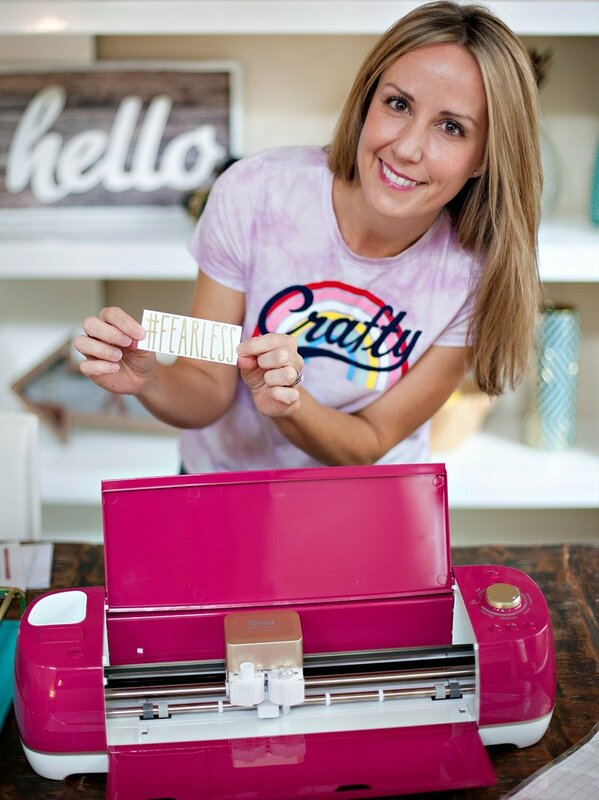 Note: the dates on the free printables have been changed to work for 2019! For this table cover, I used green felt, white duct tape (large lines), and white masking tape (small lines). Having an attractive table cover or linen makes ALL the difference in the world as far as the look of a party station! Snacks at a Sip and See can be simple and fuss-free! 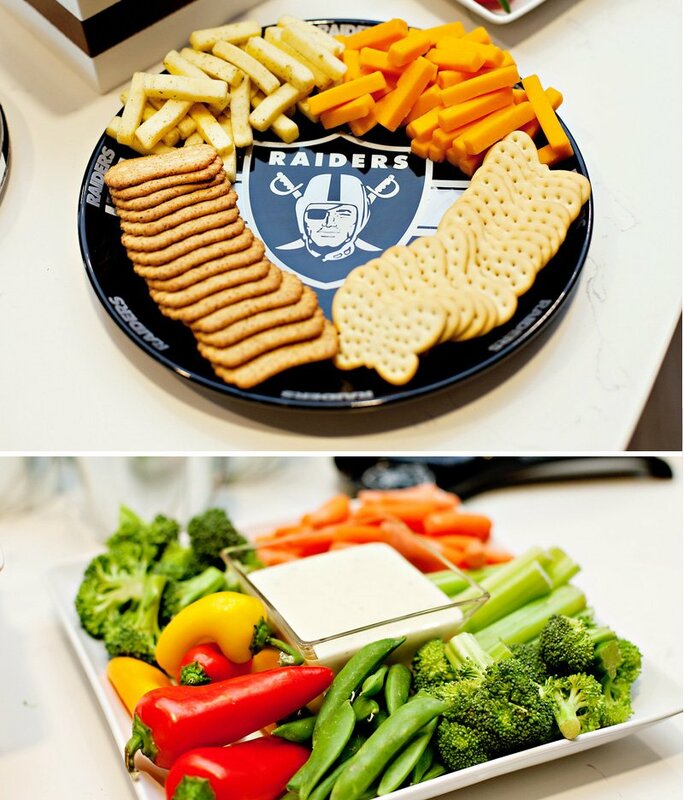 In similar fashion to the drinks, I like to have one “star”of the food table surrounded by a few crowd-pleasing basics like cheese/cracker and veggie trays. 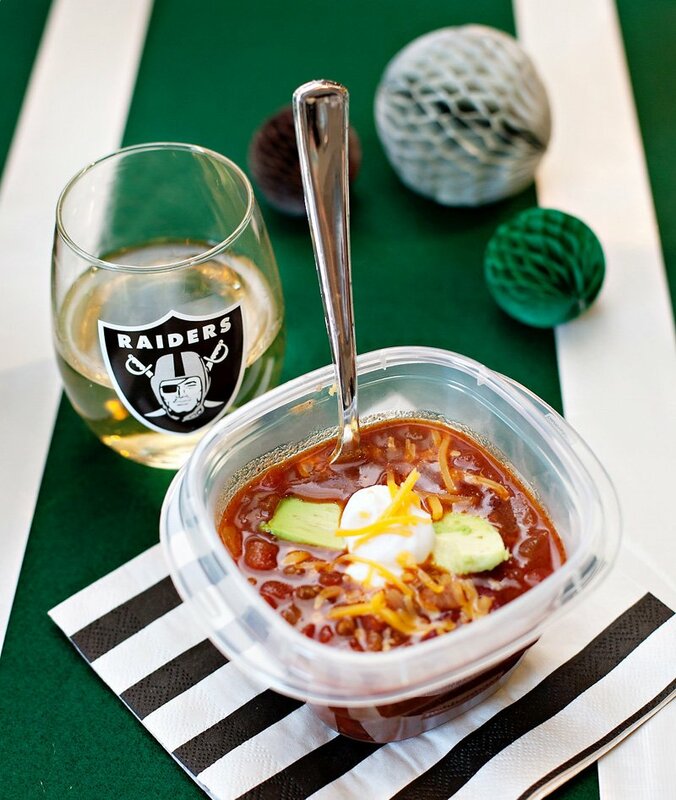 Popular garnishes for the chili (cheddar cheese, avocado slices, onions, and sour cream) were served in cute galvanized pails. 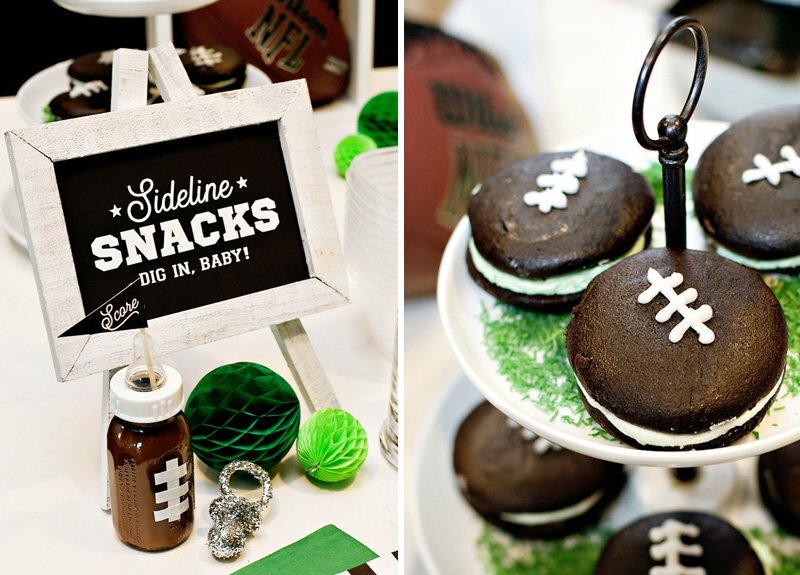 Hope you found some useful tips here for your next football soirée! 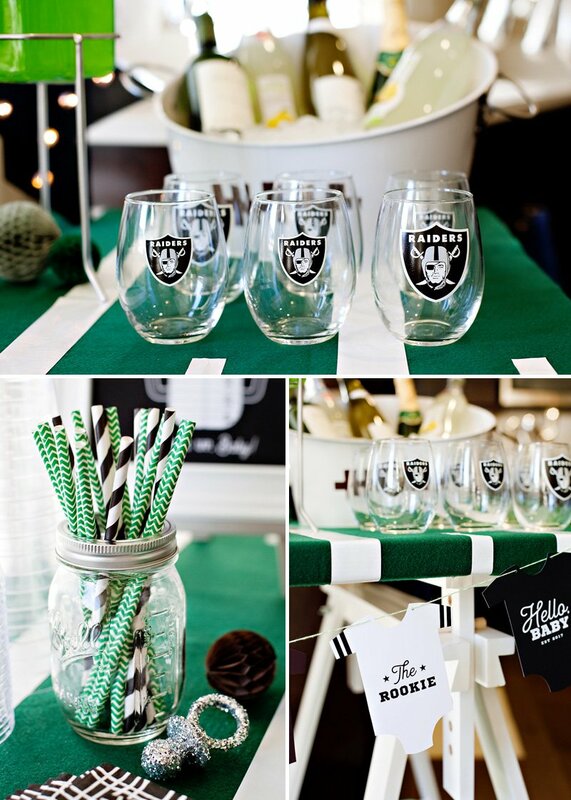 Remember to visit NFL Homegating for official NFL team party supplies, drinkware, serving trays and more. P.S. 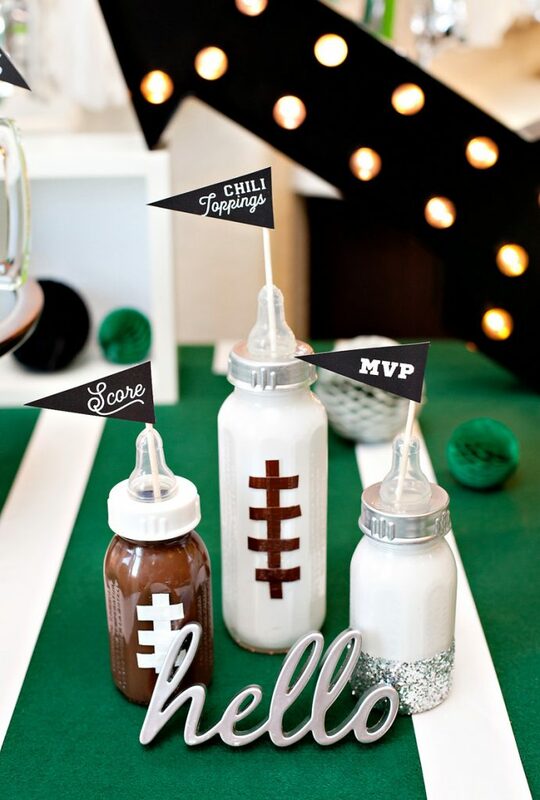 The football baby bottles pictured above were made by pouring craft paint into the bottles and letting it slowly drip down the sides, similar to what I did in this tutorial post. I cut pieces of duct tape for the “laces”. Disclosure: This post is sponsored by NFL Homegating. As always, all thoughts and designs are my own. Thank you so much for supporting the companies that make it possible for me to keep the creative content coming your way! Such a wonderful and creative theme – thanks for sharing! 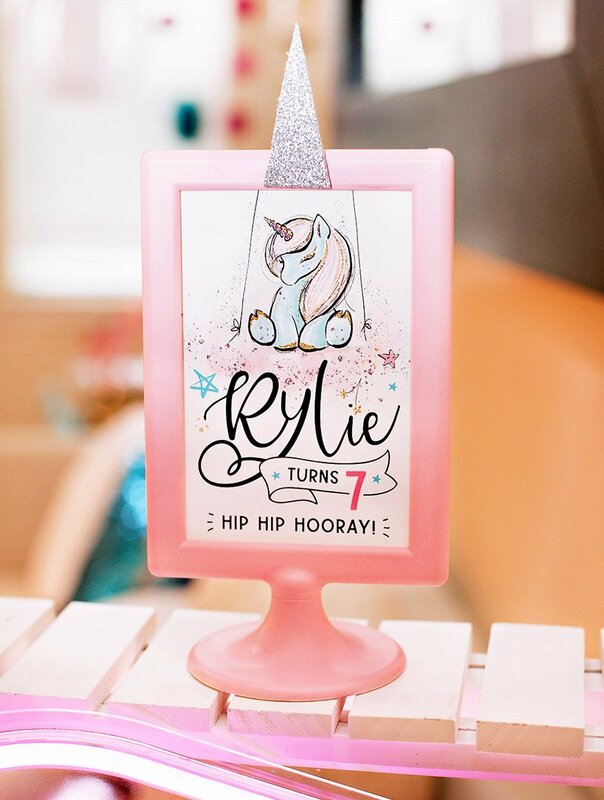 It’s great mixing things up and going all out for party themes and decorations. 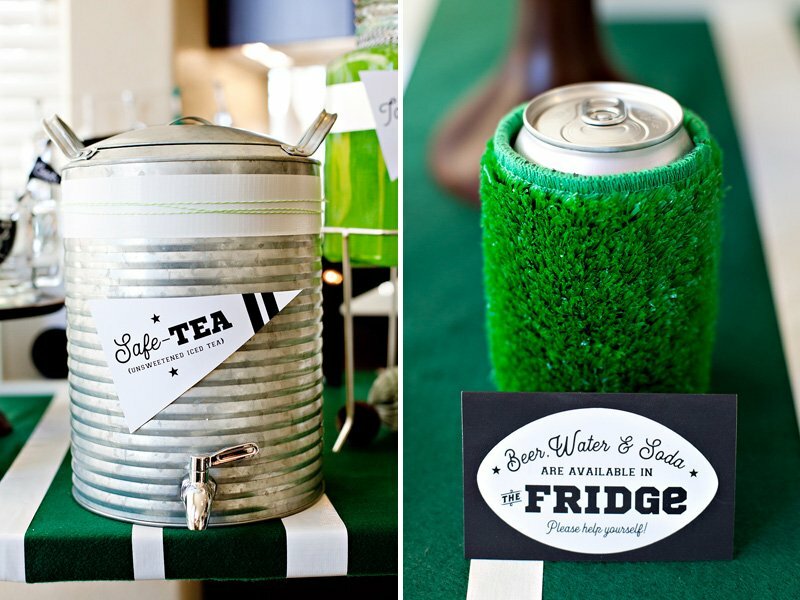 A fun addition to this theme would be dressups or having a photobooth to capture the festivities! Thank you for the free downloads – So appreciate them!! I’m helping with a baby shower for a friend and am in charge of the banner and some other things. I’m going to use your banner. Do you have the link for the football jerseys too? They are soo cute!! Thank you!!! OMG, That’s such a great idea!! Love those themed parties! Thanks for sharing! Hey girl! This is the CUTEST post I’ve seen in a very long time! Love every last detail, everything looks perfect. Mind me asking where you got that white table you covered in green felt? 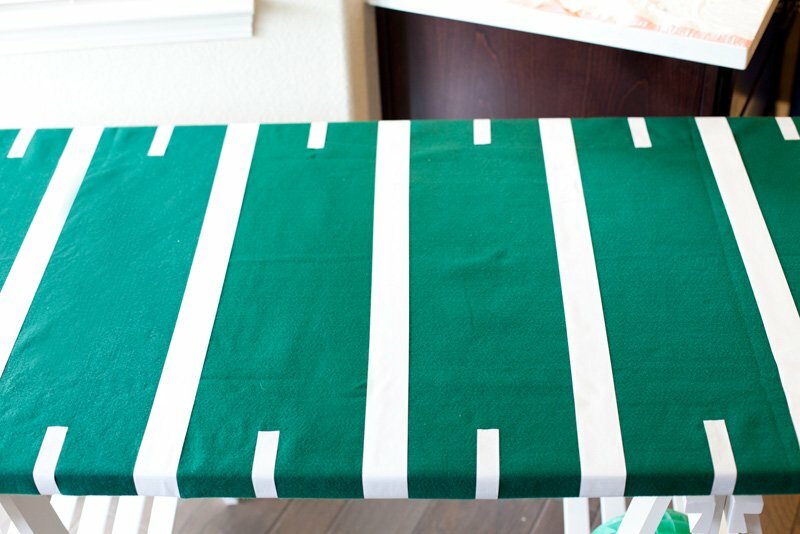 It’s going to be my newest fave party table ever – thanks for the help! Happy football season!!! 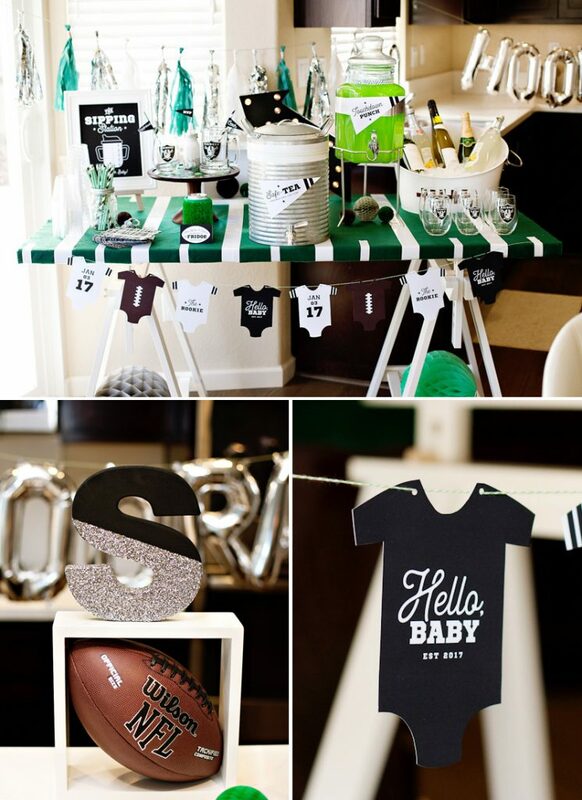 My husband absolutely loves this and if we have a boy he would like us to have a football themed baby shower.